15" MacBook Pro Sold Out? "I sold and bought my first PC a long, long time ago. Back in the late 80s I owned a Mac, I think it was a Mac2 [sic]. I honestly thought there would never come a time where I would buy a Mac. Ever. "Then I upgraded my PC to Vista. What a disaster. I had grown accustomed to my PC freezing every now and then. Enter Vista and my PC was frozen more often than it was working. The biggest culprit was MicroSoft [sic] Outlook. "The application has to have a memory leak. I could follow memory numbers as they grew and grew. Then as my email was downloading, the rules would stop working and everything went straight to my inbox. Spam and all. "I had gotten to the point where I was embarrassed to be a PC owner. The thought of someone calling me and asking me to go to my computer to find something was paralyzing (ok, not that bad, but it sounded cool writing it). "So a few months ago I made the executive decision to buy a MacBook to replace my laptop. "I'm not an Apple fanboy, but I love me some MacBook"
"It becomes difficult to purchase a MacBook Pro 15", independently of the model, stocks are at the lowest level for resellers and distributors, and the Apple Store forecast a shipping date within 7 to 10 days." Link: MacBook Pro 15": No More in Stock? "This model is based on Intel's relatively new Santa Rosa platform. Its Core 2 Duo chip speed has gone up from 2.33 GHz to 2.4 GHz but the real story is the laptop's underlying infrastructure, which gives a surprisingly large performance leap. "This is also the first Apple model to offer a high-definition screen; our review unit featured a 1,920-x-1,200 screen that looks stunning. "This MacBook Pro was also 21 per cent faster than the 8710w in Photoshop CS3 - surprising, because Photoshop is more reliant on RAM and hard-drive speed than processor performance, and both models feature 4 GB RAM and 7,200 rpm hard drives. It was also 28 per cent faster than its 2.2 GHz 15-inch MacBook Pro brother." "The vaunted '$100 laptop' that Massachusetts Institute of Technology researchers dreamed up for international schoolchildren is becoming a slightly more distant concept. "Leaders of the nonprofit One Laptop Per Child that was spun out of MIT acknowledged Friday that the devices would cost $188 if mass production, expected to begin this fall, were to start now. The last price the nonprofit had announced was $176; it described $100 as a long-term goal." PR: SanDisk Corporation has launched the SanDisk Express line of high-performance flash memory products, based on the ExpressCard technology standard. SanDisk Express products aim to deliver best-of-class solutions for professional videographers and photographers who demand speed, durability and reliability. The first product in the SanDisk Express line is the SanDisk ExpressCard, a flash memory card designed for a new generation of professional camcorders that record to ExpressCards rather than magnetic tape, hard discs or optical discs. The SanDisk ExpressCard is expected to be available in November, in 8 GB1 and 16 GB capacities. Recording time for high-definition video capture, at 35 megabits per second, will be approximately 30 minutes on the 8 GB card and 60 minutes on the 16 GB card2. Sony is the first major video equipment manufacturer to adopt ExpressCards as video recording media, with its new XDCAM EX camcorder. SanDisk and Sony have jointly developed SxS, a specification to verify that ExpressCard memory cards will support the high-speed performance required for professional video. The SanDisk ExpressCard carries the SxS logo, and is expected to be fully compatible with the XDCAM EX, which has two ExpressCard slots. "With the SanDisk ExpressCard, professional videographers for the first time will have access to a high-speed, solid-state digital recording solution," said Wes Brewer, vice president of SanDisk's Cards and Accessories Division. "What's more, because the PCI Express interface is an open industry standard, and because of the continuing decline in the cost of flash, we expect other video equipment manufacturers to adopt this compelling new format." ExpressCard is a standard created by the Personal Computer Memory Card International Association (PCMCIA) as a successor to the PC Card standard. By connecting directly to a computer's PCI Express bus, ExpressCards can read and write data at least 2.5 times faster than PC Cards. Also, ExpressCards are half the size of PC Cards - allowing slimmer designs in notebook computers and ExpressCard-based camcorders. Solid-state recording using flash memory is widely viewed as the future of video. Camcorders become lighter, more durable and gain battery life without the many moving parts required for turning tape reels or disc spindles. Digital video can also be quickly transferred into computers for processing with nonlinear editing (NLE) applications. Tanya Chuang, director of worldwide retail product marketing for the high performance imaging market at SanDisk, said: "The SanDisk ExpressCard has been designed for super-fast downloads of large video files and is ideally suited to editing in the field. Video can be quickly off-loaded to a notebook computer, with no extra cables or readers required, so the card can go back to work in the video camera as fast as possible." "I've been using SanDisk Extreme cards for several years in my still photography work, because their high performance reduces shot-to-shot time and accelerates the process of downloading images from card to computer," said Robert Farber, an award-winning fine-art and fashion photographer and videographer. "I'm looking forward to trying out the SanDisk ExpressCard, so I can gain the same kind of workflow advantage when I'm shooting video." The SanDisk ExpressCard is expected to be available in November in North America and Europe, in two capacities: 8 GB, with a manufacturer's suggested retail price of $499.99 in the United States; and 16 GB, with a US MSRP of $899.99. 1 gigabyte (GB) = 1 billion bytes. Approximation based on MPEG-2 Long GOP video compression at 35 megabits per second. PR: FastMac has announced the first & only 8x SuperDrive upgrade for Apple's MacBook & 15" MacBook Pro computers. The new drive uses one of the fastest & most compatible optical drive mechanisms to provide single layer DVD burning at up to 8x speeds and dual layer burning at up to 4x speeds. 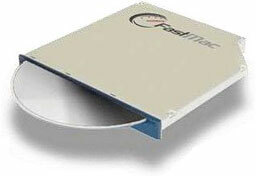 FastMac's 8x SuperDrive upgrade for MacBooks is available now from FastMac for a special introductory price of $179.95. Each drive carries a 1-year warranty and a 30-day money back guarantee. FastMac's new 9.5mm ultra slim slot loading 8x SuperDrive is built specifically for Apple's MacBook & 15" MacBook Pro computers: Its chassis is thin enough to fit perfectly (without modification) inside Apple's latest Intel based laptops, unlike the standard slimline drives found in earlier PowerBooks and iBook G4s. It replaces Apple's original slow speed Combo or SuperDrive with a 100% compatible, plug & play internal drive that is 8 times faster than the MacBook Pro's original optical drive. While the drive is user installable, professional install is highly recommended and is available through authorized dealers or via a 24-hour installation service provided by FastMac directly for an additional $89.95. Using a box in the mail service provided by DHL, FastMac will pick up the customer's MacBook or MacBook Pro, install the 8x SuperDrive upgrade and return the computer back to the customer, all within 24 hours. The optical drive upgrade can also be combined with a hard drive upgrade to obtain an almost new MacBook or MacBook Pro. Upgrade pricing starts at $99.95 for a 160 GB 5400 RPM Serial ATA (SATA) hard drive featuring 8 MB data buffer cache and a 3-year warranty. FastMac's ultra slim slot loading 8x SuperDrive for MacBook & MacBook Pro supports reading, writing and rewriting to single and dual/ double layer mode on DVDs, DVD-RAM and CDs. The drive can write to DVD-R and DVD+R media at 8x speed in single layer and 4x speed in dual/ double layer mode. It can rewrite to DVD-R and DVD+R media at 4x speeds. The drive also supports DVD-RAM reading and writing at up to 5x speeds and standard CD-R and CD-RW burning at 24x speeds. 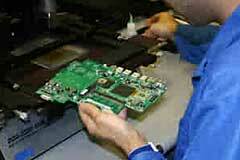 PR: We have seen a significant trend in intermittent ATI video chips on laptop motherboards. Most common is the on the Apple iBook G3 failure and G4 Logic Boards. First Phase Tech has identified that there are periodic stress fractures on the video BGA that cause video failure. Using X-ray and our BGA-1000 inspection scope, we have identified that there are inconsistent sized solder joints beneath the device. Inconsistent solder paste volume during the manufacture of the logic board results in stress not being distributed evenly (the smaller, lower mass solder joints take on the majority of the expansion stress which over time causes them to fracture). This analogy can be likened to a truck towing a car across country with two ropes, one rope is 5ft and the other is 4ft and 10in. Although both ropes handle stress simultaneously most of the time, tension is not evenly distributed and over a long trip, or period of time, the 4ft10in rope will wear out and break first. To date we have successfully repaired well over 100 of these now for various customers providing our BGA chip reflow service. Our first repaired units have been in operation for over a year with no reoccurrence of the problem. It is very unlikely you get any more time out of our repair than you got originally. For example, if it has taken 2 years for the device to have fractured solder joints, you will likely only see another 2 years at best before it reoccurs. For most people this is just fine since they do plan to upgrade to a new computer before that time. The only way to completely repair both the symptom and combat the cause would be to remove the BGA device, reball and reinstall it onto the motherboard. The cost for this would be at minimum $75 First Phase Technologies offers the basic BGA reflow for $50 ($35 for 3 or more at one time). You can contact us for more information. Make sure logic board is shipped in carton with 2" of protective packaging like bubble wrap. Fill out logic board form (download form) and send with your logic board to address below. Upon receipt, Logic board will be inspected to verify if board has been reworked, or if any other damage is present. Once video chip is reflowed or reballed we will contact you for payment information. First Phase Tech accepts all major credit cards as well as PayPal. Payment by check is also accepted but shipment will be delayed until check is deposited and clears. Return shipping to continental US is free and will be shipped by USPS Flat Rate Priority shipping. Japanese firm Shimura has released this new slick-looking aluminum metal attache-type cases for the MacBook, joining a line of metal cases for Apple products including models to fit the MacBook Pro; 12", 15", and 17" PowerBooks; 12" and 14" iBooks; and iPod nano and video. I can't read Japanese, but through the magic of Altavista Babelfish machine translation, I've determined that the colored finish on these cases is anodized and not paint, that they contain some sort of cooling plate, and that they are hand made by "Japanese domestic technical craftsmen." No word I could decipher from the fractured syntax of the translation on North American availability. PR: MoGo MouseBT from Newton Peripherals is the first in a family of mobile products. The MoGo MouseBT is compatible with any laptop, either PC or Macintosh, which is equipped with a PC slot, Bluetooth hardware and software. This technologically advanced wonder, featuring patent-pending optics, an intelligent battery management system with an integrated, minute battery that recharges in just minutes inside your laptop. MoGo MouseBT is a business-card sized, Bluetooth-enabled mouse that stores and recharges neatly inside . . . that's right, inside . . . your laptop computer's PC card slot when it's not being used. MoGo MouseBT is a technologically advanced wonder, featuring patent-pending optics and a system that automatically levers the mouse up into your hand as you work. With no batteries to replace, the MoGo MouseBT recharges in less than an hour in the PC card slot of your laptop. MoGo MouseBT is specifically designed for road warriors who hate carrying around full-sized, bulky mice, but who also despise laptop trackpads and trackpoints. MoGo MouseBT provides them with a solution to their problem, making it easier for them to work on the road. Other mice, even those meant for road warriors, just don't cut it. Mini-mice (the "walnut shells") get lost in your hand and are difficult to maneuver, and the ideas of carrying a full-sized mouse defeats the entire purpose of mobility on the go, making MoGo MouseBT a natural. Take the MoGo Mouse with You Anywhere! Provides a familiar feel & functionality of a desktop mouse. Effortless To Operate: The mouse is effortless to operate and ergonomically friendly. Store It: Always stays with your laptop so you can't lose it or forget it. Charge It: No batteries to replace. PR: Razer, manufacturer of high-end precision gaming and lifestyle electronic peripherals, has today that the Razer ProClick Mobile mouse has begun shipping and will be available for purchase from RazerPro. The Razer ProClick Mobile is an ambidextrous Bluetooth mouse suited for professionals who crave mobility. Whether one is frequenting the airport, cramped café tables or even working from home, the ProClick Mobile is designed to provide precision and mobility in constrained spaces - all without the burden and hassle of a mouse wire. "Anyone can now experience accuracy and precision from a mouse on the go. The Razer ProClick Mobile is perfect for anyone with a limited amount of mousing movement space," said Robert "Razerguy" Krakoff, president of Razer. Bluetooth 2.0 enabled with a high performance optical sensor, the Razer ProClick Mobile comes complete with superior tracking performance in a highly portable and attractive shell. Funky and mobile, yet highly precise, the Razer ProClick Mobile is available in four engaging colors: naughty, nice, sugar, and spice (black, white, pink and red respectively). The Razer ProClick Mobile can be purchased after mid October 2007 directly from RazerPro at the MSRP of $49.99 and from authorized distributors globally. 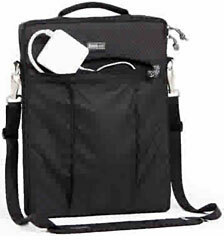 PR: Thin laptop bag accommodates up to 15" or 17" laptops with a front bellowed pocket to hold cables and accessories. 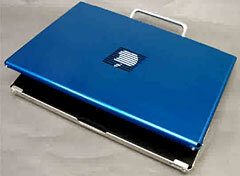 Thin padded case that will hold up to a 15" or 17" laptop. Front bellowed pocket for AC adaptors. AI 17 can be carried horizontally or vertically. Compatible With: AI 15 works with the Airport Antidote or Airport Acceleration backpacks. AI 17 works only with the Airport Acceleration backpack. Artificial Intelligence 15: Dimensions: 14.375" H x 11" W x 1.75" D (36.5 cm x 28 cm x 4.5 cm). Holds up to a 15" laptop. Compatible with the Airport Antidote and the Airport Acceleration backpacks. PR: Kensington Computer Products Group has unveiled the SlimBlade Lifestyle Collection, a line of input devices uniquely tailored to the tech-savvy mobile professional. Combining a unique feature set with unrivaled simplicity, each product is designed to work flawlessly and intuitively to fit its user lifestyle. The SlimBlade Lifestyle Collection is the embodiment of Kensington's Smart Made Simple philosophy that focuses on simplifying a consumer's experience with computing technology and designing stylish accessories that look as good and function as well in the home or car as they do in the office. The SlimBlade Lifestyle Collection also features a sleek, modern design, with products offered in timeless, classic colors like deep wine, graphite, and ice blue that allow mobile consumers to personalize their computing devices to better fit their personal preferences and lifestyles. "With SlimBlade, we set out to create the perfect computing accessories for traveling executives," said Juan Ernesto Rodriguez, Senior Global Product Manager, Kensington. "So, we started from scratch and focused on their needs and lifestyle." "Traveling executives need to get the most out of their computers in all the settings that comprise a full mobile experience - be it an office desk, an airport seat, a hotel room, or their sofa at home," added Rodriguez. "SlimBlade features the first mobile trackball, which allows road warriors to 'mouse' on literally any surface. Our media and presenter mice give them the essential controls to take charge of their work and their lifestyle. The modular notebook set gives them the flexibility to use only the components that they need, separately or in tandem. And yet all of these unique solutions are unified by elegant shapes and intuitive controls that supports the multiple layers of technology that are built into each product." At the core of Kensington's SlimBlade Lifestyle Collection is sleek, thin design with low profiles designed for easy packing, functionality and the kind of design statements that users want to project, wherever they are working " said Rodriquez. "This line is inspired by the duality of executives' work-hard/play-hard lifestyle. Kensington understands that people ultimately want a product that makes their lives easier while fitting easily into their lifestyle. Mobile professionals need simple and elegant solutions without compromise. With the SlimBlade collection, we've created a line of products that is as unique as they are." Take your presentations on the road and give them in style with the Kensington SlimBlade Presenter Mouse. 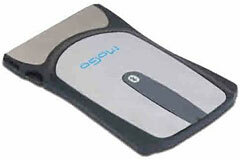 Its sleek, ultra-thin design slips easily into a pocket and feels great in your hand. And with a laser sensor, the mouse delivers exceptional tracking on almost any surface. Suggested retail price $49.99. This mouse does a whole lot more than just control your cursor. Offered in a deep wine color, the Kensington SlimBlade Media Mouse combines a mouse and media controller into one slim, sleek device that fits your hand as well as your home space. Suggested retail price $59.99. The mouse, presenter and media controller all converge into one slim, sleek unit that slips into your pocket. Outfitted in a sophisticated pewter finish, the Kensington SlimBlade Presenter Media Mouse goes beyond your expectations of what a mouse can do and how it can look. Suggested retail price $79.99. The Kensington SlimBlade Trackball Mouse works where other travel mice can't. The trackball gives you control even when there's no room to move a mouse, and switches back to mouse mode with the push of a button. Bluetooth connectivity offers up to 30 feet of range and doesn't use up a USB port. The cool, graphite-colored surface exudes an understated elegance. Suggested retail price $99.99. The innovative Kensington SlimBlade Media Notebook Set can be instantly rearranged into whatever combination you need by swapping the magnetically-attached modules on the left or right side of the keyboard. The set includes a wireless keyboard, 17-key keypad and laser mouse. The result is total control of your media and home workspace. Each component features a graphite finish. Suggested retail price $129.99. A matching media remote control is available exclusively at Kensington.com for an additional $19.99. The Kensington SlimBlade Presenter Mouse (SKU K72283US, K72285US), Kensington SlimBlade Media Mouse (SKU K72282US), Kensington SlimBlade Presenter Media Mouse (SKU K72280US), Kensington SlimBlade Trackball Mouse (SKU K72283US), Kensington SlimBlade Media Notebook Set (SKU K72279US) will be available for pre-order at Amazon.com and Kensington.com starting on September 17, 2007 and other major retailers in late September.